Es ist Politpause… also keine Informationen, Vorträge und Filme. 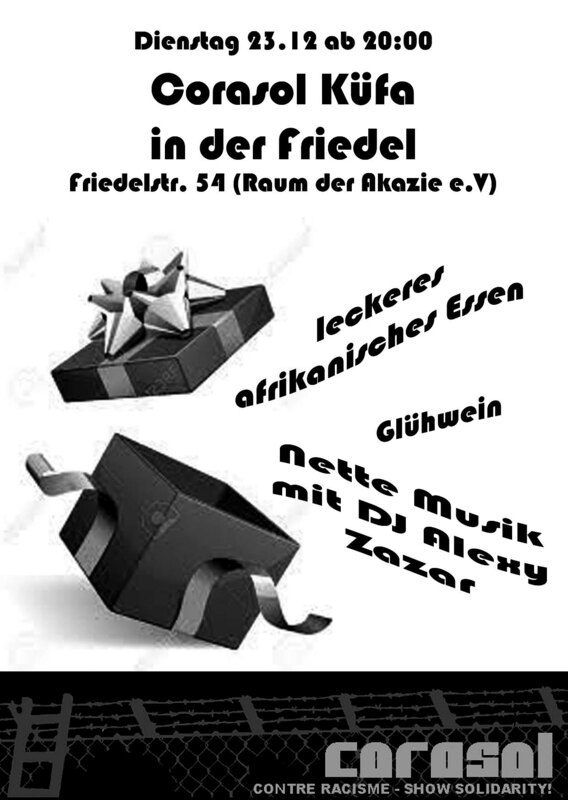 Einfach lecka Essen und gute Mucke von DJ Alexy Zazar! Spenden sind willkommen, kein Muss. Jeden 4. Dienstag im Monat. It’s holidays… so no information, presentation, film. Just good food and music with DJ Alexy Zazar! We‘re happy for donations. Every 4th Tuesday in a month. Cuisine contre le racisme à 20h á Friedelstr. 54. Nous, corasol voulons vous inviter pour notre cuisine: sauce d‘arrachide, riz, beignets. Nous vous remercions pour des dons pour le repas. Chaque 4. mardi dans le mois. Du browst gerade in den Corasol Weblog-Archiven nach dem Monat Dezember 2014.